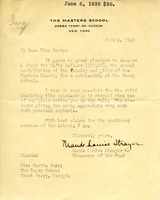 Maude Strayer encloses a donation to the Berry schools from her school to contribute to the yearly scholarship she gives. 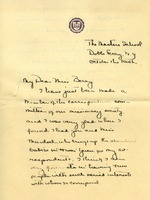 Maude writes to Martha with the annual contribution of the Faulty and girls of the Master School to Berry. She also writes that they hope when the student corespondent writes next fall that she will receive more attention from one of the students. As it is education and establishes a friendly station with the school. 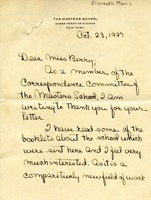 Mary E. Benjamin writes of her recent appointment to the correspondence committee of the Masters School's missionary society and her excitement at learning that Martha Berry is on her new list of correspondents. 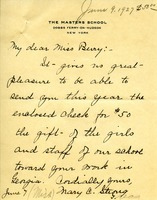 Mary Benjamin particularly admires Martha Berry's work at the Berry Schools because of her Sunday school's prior correspondence with someone who worked with the mountain people of Kentucky. She goes on to say that she believes a Masters School student is currently on scholarship at Berry and that she would like to know more about them so that her school may establish some kind of personal contact with him/her. 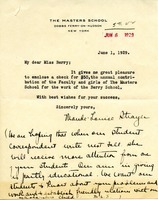 Morris, part of the Correspondence Committee thanks Miss Berry for her letter and booklet, and asks Martha Berry to send additional information about The Berry Schools for her and the other girls at the school. Miss Strong and the girls and staff at the Masters School send a donation of $50. 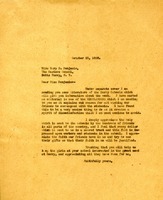 This letter is a fifty dollar donation from Jane D. Cushing as well as an explanation as to why the donation is not the full one hundred and fifty dollar amount.